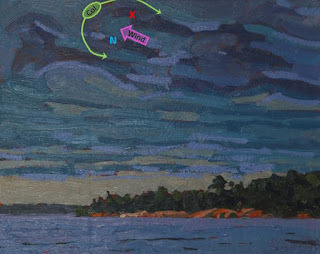 Phil Chadwick's Art: #2004 "Killbear Morning Altocumulus"
After completing #2003 "Killbear Kilcoursie Bay Sunrise", I simply turned the easel clockwise to the west to view the other tip of Killbear Provincial Park. Davy Island could be seen as its own entity. The Twin Points formed the mainland but they were indistinguishable from the distance of my vantage from the beach. The altocumulus cloud was distinctively shaped with some of the individual moisture tuffs revealing a local wind maximum and deformation zone. Only a slight increase in wind speed is required to create shear. A smoke ring is simply a puff of wind and it is a three dimensional circle of spin. 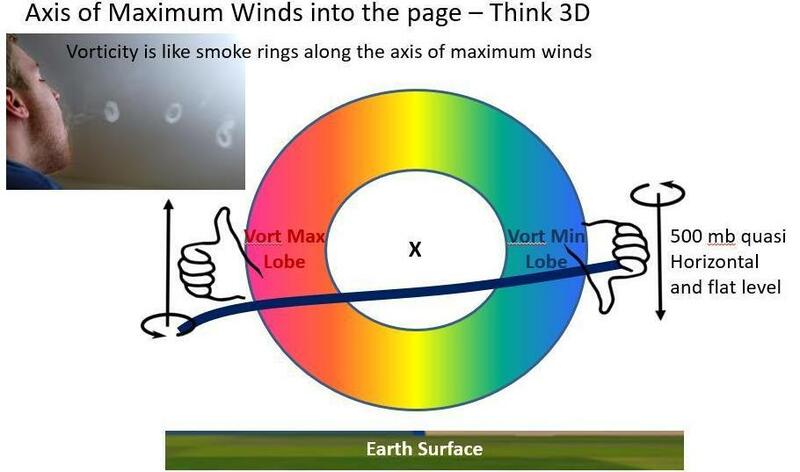 Each puff of wind must generate its own three dimensional "smoke" ring. The atmosphere has a thickness comparable to the skin of an apple more or less. Actually 99% of the atmosphere is found within 30 km of the earth's surface. The earth's radius is about 6400 km so the atmospheric layer is only 0.5% of the earth's radius. That's shallow and that is why clouds and atmospheric circulations tend to be horizontal or flat as a pancake. Thus we think that the clouds and atmosphere are stratified into layers. Only those swirls within the horizontal cross-section through the 3D smoke ring are made visible in the pancake atmosphere. 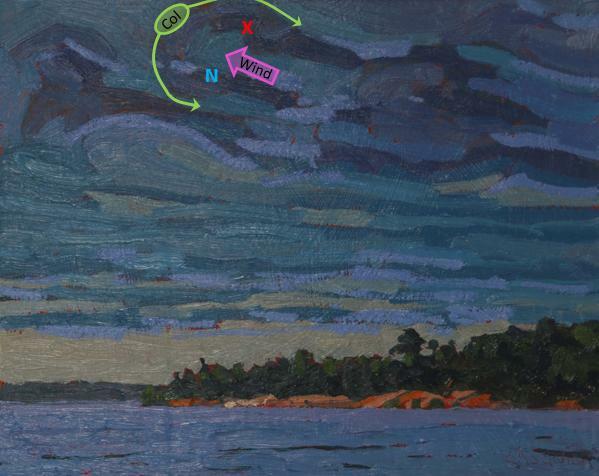 Meteorologists identify these horizontal cross-section swirls as either cyclonic (counter-clockwise) on the left side of the wind with the wind on your back - or anticyclonic (clockwise) on the right side of the wind. In the three dimensional world these swirls are just cross-sections through the smoke ring with the puff of wind and their sense of rotation arbitrarily defined by your viewing point of reference. If we look along the same direction as that same puff of wind and follow the smoke ring with our right thumb we see that both cyclonic and anticyclonic spin can be found along the same smoke ring. Meteorological convention has just separated this single, simple physical phenomena into two separate branches. The cyclonic swirl must always lie to the left of the wind maximum looking downstream with the wind. The anticyclonic swirl must always lie to the right of the wind maximum looking downstream with the wind. That puff of wind that created the smoke ring in turn generates a three dimensional skin that envelopes the moving air associated with the wind. The 3D deformation skin is very much like the outer skin of a jelly fish. A cloudy, horizontal cross-section through the fabric of the deformation skin reveals the deformation zone. I have made a meteorological career out of describing the defomration processes and sharing with that others. A deformation zone (DZ) reveals everything you need to know about that portion of the atmosphere. The DZ was always there in plan view to understand and I believe the ancient mariners and farmers did have a practical grasp of what it all meant.